Jun Qian joined the music faculty at Baylor University in 2012, when he was also appointed principal clarinetist of the Waco Symphony. 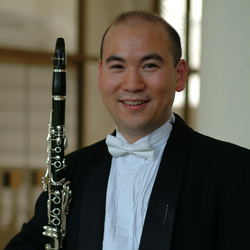 Dr. Qian holds a Bachelor of Music in Clarinet Performance from Baylor University where he was a student of Richard Shanley, and a Master of Music in Clarinet Performance, and a Doctor of Musical Arts from the Eastman School of Music where he studied with Kenneth Grant and Stanley Hasty where he performed as principal clarinet with the Eastman Wind Ensemble (on full scholarship). Chinese-born, Professor Qian was the principal clarinetist with the Shanghai Philharmonic. Qian won first prize in the International Clarinet Association’s Orchestral Excerpts Competition and third prize in its Young Artist Solo Competition in 1997 (the first artist in the history of the ICA to receive prizes in both competitions in the same year). As an endorsed artist for both Selmer of Paris and D’ Addario of New York, Qian has appeared as a concerto soloist with the Shanghai Symphony, the Eastman Wind Ensemble, the Shanghai Philharmonic, the Xiamen Philharmonic, and many other ensembles.